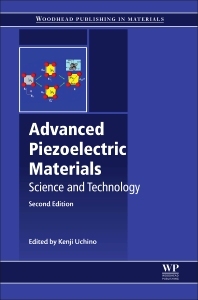 Advanced Piezoelectric Materials: Science and Technology, Second Edition, provides revised, expanded, and updated content suitable for those researching piezoelectric materials or using them to develop new devices in areas such as microelectronics, optical, sound, structural, and biomedical engineering. Three new chapters cover multilayer technologies with base-metal internal electrodes, templated grain growth preparation techniques for manufacturing piezoelectric single crystals, and piezoelectric MEMS technologies. Chapters from the first edition have been revised in order to provide up-to-date, comprehensive coverage of developments in the field. Part One covers the structure and properties of a range of piezoelectric materials. Part Two details advanced manufacturing processes for particular materials and device types, including three new chapters. Finally, Part Three covers materials development for three key applications of piezoelectric materials. Dr. Kenji Uchino is a pioneer in piezoelectric actuators, Professor of Electrical Engineering at Penn State University, and Director of the International Center for Actuators and Transducers. He has authored 550 papers, 54 books and 26 patents in the ceramic actuator area.